William Lee Miller is Scholar in Ethics and Institutions at the Miller Center. 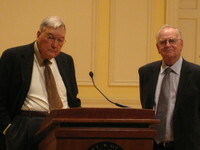 From 1992 until his retirement in 1999, Mr. Miller was Thomas C. Sorensen Professor of Political and Social Thought and Director of the Program in Political and Social Thought at the University of Virginia. He was professor of religious studies from 1982 to 1999, and chaired the Department of Rhetoric and Communication Studies from 1982 to 1990. Prior to coming to the University of Virginia, he taught political science and religious studies at Indiana University, where he was also the founding director of the Poynter Center on American Institutions, and at Yale University and at Smith College. During the 1960s, he served for six years as a member of Board of Alderm William Lee Miller is Scholar in Ethics and Institutions at the Miller Center. From 1992 until his retirement in 1999, Mr. Miller was Thomas C. Sorensen Professor of Political and Social Thought and Director of the Program in Political and Social Thought at the University of Virginia. He was professor of religious studies from 1982 to 1999, and chaired the Department of Rhetoric and Communication Studies from 1982 to 1990. This poll will examine the choices for the John Quincy Adams reading selection which will be the next President covered in the Presidential Series. The order for the Presidents selected was determined by the group membership. This selection will begin January 9, 2012 and will continue for three - four months - depending upon the length of the selection. The Bill Clinton selection will take a long time so rather than begin this selection around Christmas or other important religious or family holidays, we are waiting until January 9, 2012 to begin the John Quincy Adams selection. This discussion will be led by Bryan. Bryan has an extraordinary background and will be a great moderator to lead this discussion. He has assumed the responsibilities for the Presidential Series reads and will be leading these book discussions. We have added all of the books nominated on the John Quincy Adams thread and a few others. However, if you do not see your favorite book on this list; then just comment or pop me a note and I will immediately add it to this poll. You can always change your vote at any time; so nothing is lost. Some of the John Quincy Adams's books deal with only a certain period of his life, some may be multi-volume (if that is ever the case - I always add both separately), some deal with other topics too; some are all encompassing, others deal with specific events in Quincy Adam's life or presidency and others are by the man, himself and some may be about other relationships or focused on specific issues during his life or presidency. Note: Be careful when making your selection: a great many of these books have the same title (John Quincy Adams) so be careful to make the right choice. Note: There is no bookcover available.